Florida Trip – Day 11: Ollivander’s! So today was our last day at Universal and the plan was very specific. We would get to the park before it opened and as soon as we got in we would head directly for Ollivander’s Wand Shop to see the show there where a wand chooses one lucky person. I was really hoping that Ollivander would choose Alex or Ryan to be the lucky kid but sadly that wasn’t the case. It was still an interesting show however. After the show you exit into the shopping area where you can buy your own wands. Alex quickly chose a duplicate of Hermione’s wand. Ryan took a bit longer before settling on Victor Krum’s wand. Nikki was wanting Hermione’s wand as well so she wasn’t going to buy one. I convinced her to look through the non-name wands and see if there was one there otherwise she would regret not picking one out. She ended up with an 8″ wand made out of Holly. I chose Dumbledore’s Wand, the Elder Wand. The two staff members in that shop were amazing and the one was a true Potter fan as we had a discussion about Sorcerer’s Stone vs. Philosopher’s Stone. We spent more time in Hogsmeade today looking at everything and going on the Flight of the Hippogryph coaster. Alex and Nikki also went on the Forbidden Journey ride through Hogwarts. Alex and I did a couple runs down Rip Saw Falls before heading over to Universal Studios where the plan was to hit up M.I.B. for Alex and Woody Woodpecker’s coaster for Ryan. Did all that, had some food and called it a day. If J.K. Rowling gets a percentage of merchandise sales from these parks then we just helped her towards her next Bentley. Came back to the villa and the kids and Nikki headed over to the pool while I chilled for a bit. Florida Trip – Day 10: Did Anyone See A Wizard Around Here? Today was our second day visiting Universal Studios and Islands of Adventure. I’m happy we spent some time wandering around the first day as it gave us an idea of what we wanted to do this day. We also used our unlimited meal deal and Coke Freestyle vouchers. I was a little concerned when we bought them that we wouldn’t eat enough to justify the purchase however once we ignored the “no sharing please” part of the voucher it worked out great. We went through the park and re-rode some of the rides we rode our first day while also doing some new rides. We also made a quick stop at guest relations to pick up a guest assistance card for USF/IoA as well. Today was also our first time taking advantage of the ride-swap service offered by the parks as there were a couple rides that we wanted to do that Ryan was too short for. Namely the ride through Hogwarts and Rip Saw Falls water ride. It really is a terrific feature that allows one parent to stay with the too-small kid while the other parent rides the ride (with or without a child). I’ll do what I can to get Nikki to write a post about her take on the Wizarding World of Harry Potter but for me the whole area was magical. Even the line through Hogwarts to get to the ride was amazing. The ride itself was…good. It’s a combination ride that involves moving through the castle as well as some simulation parts such as the quidditch pitch. Some of those simulation sections started to make me feel queasy so I did the smart thing and closed my eyes. Alex was a trooper though and kept his eyes open through it all. Twice since he rode with me and then with Nikki. He didn’t get sick at all. We stayed for the nightly show that Universal puts on in the center of the the lagoon celebrating 100 years of Universal movies. It was cool but a little lackluster after seeing the Disney fireworks display. We managed to do some damage in the Hogsmeade gift shops and are heading back for round two tomorrow to see a man about some wands. Florida Trip – Day 9: Let’s build! Sunday was the day we planned to go to LEGOland, a theme park built around the popular building bricks. It sits on the site formally occupied by Cyprus Gardens. Yes, I will happily trade flowers and crap for little plastic blocks! Don’t want to bury the lead here so I’ll jump right to it – this place was GREAT! All the rides were designed for kids and indeed, there was only one ride in the entire park that Ryan was too small to go on and it wasn’t even open that day so no one lost out. The kids had a blast checking out all the various rides and Alex went on some coasters all by himself. I wasn’t sure if we’d be able to fill the entire day there as we got there right at park opening but before we knew it there was only an hour left to go. At that point I broke off from Nikki and the kids and went shopping while they did some more rides. It took a LOT of will power not to buy every LEGO set that I cast my eyes upon. Plus they also have a pick-a-brick section where you can buy bulk LEGO. Today was a busy day. For the first time ever Disney celebrated Star Wars Day (May 4th. Get it? No? Oh well…move along, this is not the post you’re looking for) at Disney Hollywood Studios. There were tons of character appearances and special “Limited Time Magic” merchandise and food options. In what had to be the worst coincidence ever, the park’s ONLY Star Wars themed ride, Star Tours, was down for the better part of the day. The park was insanely busy as a) it was a Saturday b) it was the first sunny day in a week and c) Star Wars geeks flocked to their new mecca in the South. The lineups for the rides were LONG – even for rides that you wouldn’t think would have long lineups. One of the most popular rides appeared to be the Toy Story Mania ride where you went on a cart ride through a shooting gallery and tried to amass points. Indeed, it was a great ride that we went on more than once. Kids loved it. Only complaint about it was the method of firing. Instead of a standard trigger to shoot there was a ball and cord at the back of the cart-mounted gun that had to be pulled on to fire. Ryan *almost* went on The Twilight Zone Tower of Terror. He and Nikki went through the line and apparently made it up to the top but the darkness made it to scary and he decided not to finish. I give the kid credit though – he made it farther through the ride than I would have! We stayed until the end of the day to see the Fantasmic light and fireworks show which I think both kids enjoyed. Florida Trip – Day 7: Down Day You Say? Huh. Thursday afternoon we decided that we would make Friday a down day. Hang out at the villa, maybe go swimming if it didn’t rain. Do laundry. Relax a bit. “Hey! Let’s go see Iron Man 3 tomorrow morning at 10am in Downtown Disney! Then we can check out Disney Quest and the Lego store as well,” I say. Everyone likes the idea so I order up the tickets on the AMC webpage and we leave for Downtown Disney about 8:30am. It was opening day for a highly anticipated movie at a resort movie theater so I figured that there may have been a line-up – even for the 10am show. If you have never bore witness to the size of building required to house 24 movie screens – lemme tell you – it’s HUGE! We were in theater one which was quite possible the largest movie theater I’ve ever been in. I believe that there was also a balcony section above us. This theater also featured the new ATMOS sound system. The trailers came on and we saw a trailer for the upcoming Thor sequel and let me tell you – the 3D in it looks INCREDIBLE! Iron Man 3 was also in 3D and for a movie that was converted to 3D in post they have done an amazing job. It was a great movie. Without giving anything away, it will be interesting to see if they bring Stark back for a fourth solo flick. After the movie we walked down to the LEGO store. Wow. So. Much. Awesomeness! I could have spent a LOT of money there. At one point I was holding the LEGO Architecture series model of Falling Water in my hands. SOOOOO tempted. We picked up a couple small things though. I figure we’ll be exposed to FAR more LEGO on Sunday when we visit LEGOland. When we finished up there we headed home and decided to strike out for our first trip to the pool. It was drizzling rain but the kids didn’t care. They had a great time in the pool. Today is our first trip to Disney Hollywood Studios. They are doing a special celebration today since it’s Star Wars Day (May The Fourth Be With You – get it?) and there is supposed to be special character appearances throughout the day. Although ironically, unicorns were involved yesterday as we parked in the “unicorn” parking lot of Animal Kingdom. And we had half the required ingredients for rainbows. Rain. Lots of it. It was raining. We knew it would rain. We didn’t care. We struck out for Animal Kingdom. Never having been there I was excited to go. We purposely stayed clear of it in 2002 when we went as it had just opened (well, 4 years prior) and still hadn’t fully completed construction. It was going to be a long day for me. My foot was hurting for some mysterious reason and walking was…difficult. But I could limp it out. Would just need to sit down for more frequent breaks. We get to the park and head in. Crossing over the bridge to “Discovery Island” a photographer takes our pic with the centerpiece Tree of Life in the background (AK’s equivalent of Cinderella’s Castle or Spaceship Earth). We go into Discovery Island and see a few animals including black swans and ring tailed lemurs. Neither of the kids were really about animals today though. They wanted rides. So off we limped to Dinosaurland, U.S.A. – an obviously dinosaur-themed area that had a few rides. Unfortunately Ryan was only big enough for two of them and the roller coaster that he desperately wanted to go on was not one of them. We did go on one ride “DINOSAUR!” that was a car-based ride that took us back in time searching for a dinosaur. Nikki & I enjoyed it but it was a little scary for the boys. We really didn’t care about the rain as we were all soaked from the water ride but it was raining. My foot was still hurting. We decided to call it a day. We didn’t even make it into the “Africa” section of the park. There was one more ride there but the kids weren’t really interested in it. There was also a couple great walking tours that would have provided some great pictures of animals. But walking. And the kids weren’t about the animals. On the way out we stopped at Rainforest Cafe for lunch. This is apparently the largest Rainforest Cafe in the world. Never having dined in one it was quite the experience. Quite the loud experience. And I’m 99% sure the staff must hate it whenever someone orders this dessert they have called The Volcano as it’s delivered to the table by a half dozen servers clapping and chanting like it’s someone’s birthday. Animal Kingdom didn’t rank high in our books as places to return to anytime soon. We got back to the villa and I rested for the afternoon. Woke up with my foot feeling much better (as in I could actually apply pressure to it). Went to Denny’s for supper, came home and chilled. Only other crappy part of the day was Ryan’s tablet decided to die. Won’t charge anymore. And while trying to see if I could fix it I cracked the glass covering the screen. So both tablets now have cracked glass and Ryan’s won’t work at all. Good thing they were stupid cheap. Florida Trip – Day 5: Is that the best you got Florida? I’m writing this first thing Thursday morning with a right foot that is extremely sore. Not entirely sure what is wrong with it but it hurts to put pressure on the heel. Walking will be slow going today. Yesterday saw us, by popular vote, head back to the Magic Kingdom to finish it up. The kids wanted to start the day off with a repeat run on Big Thunder Mountain Railroad and on Splash Mountain but since we were early and the wait wasn’t long we headed into the “town theatre” where you could meet Mickey and get pictures. We did that and then we headed across the town square to a small building that was requesting volunteers. We had NO clue what it was about but hey, we’re here for an adventure! Turns out it’s a park-wide interactive adventure game for guests to play. You are given these cards along with a special key card and a map. You then visit various windows throughout the park which activate with the keycard and then use the other cards you were given to defeat various Disney villains. We did that throughout the day as we made our way from area to area. So we started off in Frontierland getting wet on Splash Mountain and riding the roller coaster. Ryan LOVES roller coaster. I forgot to mention it yesterday but on his own he picked up what other riders were doing and on the big drop he put his arms up in the air like a true pro! It was so awesome to see. After that we hopped aboard the train and jumped over to Fantasyland to finish up the rides there. We finished up in Tomorrowland and did the few rides there. Tomorrowland, offering a glimpse of the “future” isn’t looking quite so futuristic anymore. Hopefully once Disney completes their big expansion/refurbishment of Fantasyland (recently opened Belle’s castle and Ariel’s grotto and are in the middle of building a roller coaster) they’ll tackle Tomorrowland and completely redo that. Does anyone actually visit the Carousel of Progress anymore except to rest their feet or seek refuge from a sudden downpour? We left the park about 6:30ish and on the monorail ride back to the parking lot it became a torrential downpour. I’m glad we weren’t out walking in that. Today? We’re thinking Animal Kingdom. There’s something to said about the weather here in Florida – it’s never right. Well, at least the forecasts. Or maybe its my fault that I chose Kissimmee for the weather forecast location instead of choosing one of the Disney properties. Weather cells apparently are VERY localized here. The weather for the day was calling for basically rain all day including thunder and lightning. Uh-huh. Sure sure. At this point we’ve basically given up on planning too far in advance. With Alex being sick on Monday and the fact that is was supposed to rain all day yesterday (I’m writing this first thing Wednesday morning) the first plan was going to be hang out at the villa all day. However when we got up the weather wasn’t bad at all and they were now saying that it wasn’t going to pour until about 3. Alex was feeling great so we decided that we’d hit up Epcot as most of the attractions are all indoors there so the only rain exposure would be walking to and from buildings. I had wanted to watch Epcot’s nightly fireworks show Illuminations but if the weather didn’t cooperate oh well. So off we go to Epcot. This was our first trip directly from the villa and travel time was all of about 10 minutes. Can’t complain about that. Get into Epcot and parked close enough that we didn’t even need to ride the tram to the front gate. Once inside we headed first for Spaceship Earth – the ride that takes place up and inside the giant ball. I was happily impressed that Alex was engrossed by it and Ryan was also paying attention. We then went and got a Fast Pass for GM Test Track. Other rides we checked out were The Seas With Nemo and Friends and Journey Into Imagination with Figment. The boys liked both of those, especially seeing the dolphins. We had lunch at Electric Umbrella and then made our way over to Test Track. Alex was apprehensive about it but ended up loving it. It should go without saying that Ryan absolutely loved it! So it rolled up on about 2:30 and we had pretty much done everything. Alex wanted to go to the Turtle Talk session with Crush so we headed back to ‘The Seas’ and caught that show. Let me tell you dude, it was totally righteous! Kids and parents alike all had a great time! You may have noticed that I didn’t list a lot of rides. Well…that’s because we didn’t do any others. I’m sure that there’s a specific demographic that Epcot is absolutely ideal for. A family of four with two young’uns isn’t it. Kids don’t care about flowers, they don’t care about green ecofriendly houses (although I thought that was cool), most don’t care about the various pavillions. Test Track? Sure. Nemo? Sure. Although, as we went through the queuing area for the Nemo ride I couldn’t help but wonder exactly how many people they were ever expecting to line up for that ride. The queue area, even in it’s absolute shortest configuration still took a good two minutes walking non-stop. While Epcot was busy there were no significant waits for any of the rides we chose to do. Okay, 2:30 and we’re done. Let’s hop on the monorail and venture over to The Magic Kingdom and start to work our way through there. I figured that we’d get through a couple of the areas before calling it a day and that very well could have been what happened…except…for our friend Dana. Dana is the mom of some of the kids that Alex and Ryan go to school with. She recommended that we obtain a doctor’s note stating that Alex doesn’t handle lines very well and visit guest relations. They may give us a “Guest Assistance Card” which, in theory, provides quiet places to wait. In practice…well that’s a whole other story. That little card has more power than The Doctor’s Psychic Paper (Doctor Who TV show reference there). If the ride is a FastPass ride you go up to the FastPass entrance, show this card and they wave you through the FastPass line. It’s like Magic! In the Magic Kingdom! I suppose if one has to find any benefit from your child requiring daily medication this is it! Anyway, thanks to this card we were able to get through long lineups quite quickly and made it through all the rides in Adventureland, Frontierland, Liberty Square and started in on Fantasyland. Now we did skip a *couple* of the rides/attractions in those areas – like the somewhat boring Tom Sawyer’s Island. But we did pretty much every other ride. Now, remember above where I said Epcot was busy but the lines weren’t too bad? Magic Kingdom was INSANELY busy. People were lined up 20 deep just to buy ice cream! Still, other than FastPass rides the longest wait we had was about 10 minutes. So it’s about 6:30 and the kids are saying they aren’t that hungry but I was and Nikki kinda was so we found a place in Fantasyland called Pinocchio Village Haus that served up flatbread pizzas. Ate some food and relaxed for a bit. Feet = SORE. But we weren’t done!!! We leave Magic Kingdom and hop on the monorail back over to Epcot. The weather is threatening but at this point I’m really hoping we’ll see the fireworks show. We get to the gates at Epcot and I ask the guy if the fireworks are still happening. His response was “you’re not from around here are you?” and went on to say that short of LITERAL hurricane weather the fireworks shows happen. Sweet. In we go. It’s about 8:10 and the show starts at 9:00 so we have a bit of time to sit and wait. It was a tough 50 minutes for Alex but our four new foul friends, Bill, Sam, Albert and Charles. These four ducks were hanging out by where we were waiting for the show and were looking for food. I dug up a few potato chips and Alex and I both fed them to the ducks. Ducks like BBQ Ruffles. Who knew? Soon enough it was 9:00 and the show started. Alex thought it was great but wasn’t quite ready to concede that it was worth the wait. We got back to the car and we weren’t even out of the Disney property and Ryan was out like a light. So that was day four – Tuesday, April 30th. So far the trip has been amazing! The morning saw us have a nice breakfast down in the hotel lobby followed by packing and trying to decide what to do. We seriously considered making a trip up to Kennedy Space Center for the tour there but it was EXPENSIVE! Hey Obama – how ’bout you shift some of those billions spent on defense to NASA so that they can run tours without causing families to sell of a kid to pay for it? So we figured just head for Kissimmee and play it by ear. Part way there I had an idea to use our “extra” day at Universal Studios. We could go through both Universal Studios Florida and Islands of Adventure fairly quickly and hit up a few rides while figuring out what we want to do when we spend full days there later on in the vacation. We got to the park just after 10. I’m going to have to assume that my GPS gave us the most direct toll-free route as I requested but it happened to be mired in construction so it seemed a lot slower than it should have been. Although I did see the coolest Chrysler/Jeep car dealership on the way. Their “lot” was actually two or three parking levels built above the dealership. Such a cool idea that vastly reduces the amount of land a full-size dealership needs to park its inventory. We started our day with the Universal Studios portion of the park. The first ride we did was the Shrek4D adventure that was pretty cool. We had some concern that the motion of the chairs would affect Alex’s motion sickness but it was fine. Kids had a great time on that. Next up was Twister, an attraction Nikki & I both fondly remembered from our 2002 trip. Alex was hesitant to go on it but after some cajoling we got him through the doors and he ended up having a good time on it. Did a bit of walking and looking at things before we ended up at the next ride – M.I.B. Alien Attack. Again, a favourite ride from 2002. It’s held up really well and the boys had an awesome time. Although, between you and me, the other three really dragged down our team’s points average. After that ride we decided we’d head for lunch and chose Richter’s Burgers. The boys weren’t that hungry but Nikki and I each had a chicken burger and I had my first Cherry Coke of the trip. This place also had the Coke Freestyle machine but I didn’t buy the $11 cup to let me use it this time. We have passes for a couple of them that we’ll use on our next visits. After lunch we headed over to the kidszone and the boys played in this little playland area and we also went on the roller coaster that was in this area. After that we left Universal Studios (USF) and headed over to Islands of Adventure. Same plan as USF – scope out the good rides, do a few of the fun ones and figure out what we want to hit next visit. One that quickly became a must-visit this trip was the Jurassic Park River Adventure. The ride is scheduled to be closed for some refurbishment starting on May 5th and we’re not planning on being back there until after. It’s water log ride that is amped to the max. Alex LOVED the log ride at Ontario Place when we went a couple years back. He kept asking if this ride was bigger. I knew that it was but I kept putting him off as I was afraid he would back out. The big drop is FAR taller and much steeper than what Ontario Place had to offer. He handled it like a trooper though and loved it just as much. After, when I showed him the building that we dropped out of he confirmed that if he knew it was that tall before he wouldn’t have gone on but he was glad that he did. In Suessville we went on a little elevated train ride around that part. It was cute but not that exciting. Kids were starting to get tired and we wanted to get checked into the hotel so the final ride we went on was the Spiderman 3D ride. A wee bit dated but still a fun ride. A true motion simulator ride that really had me worried about Alex’s motion sickness but the little said he felt fine afterward. That was a relief. The day was a great day. The weather was hot and mostly sunny although it did start to cloud up toward the end of the park visit. It was busy at the park but because of the fact it was a Monday the lineups were quite manageable. The longest one we went it said 25 minutes and there was no way it was 25 minutes long. Hopefully we chose a good time to visit and all the parks will be like that. We got to the hotel and got checked in and decided to head out to TGIFriday’s for supper. Around our arrival at the restaurant Alex started feeling sick. We went in to eat since we were all hungry. Alex ordered but by the time the food arrived he really wasn’t feeling well. At all. Being the awesome parents that we are we told him to just lay on the bench and rest while we ate. (Hey, we were hungry!) After supper we came “home” and Nikki got the kids ready for bed while I went to WalMart for some groceries. Lemme tell ya – there’s something awesome about being able to buy my rum and the same place I can buy everything else! So we’re all settled in for the next couple weeks and have some groceries. Oh and we have rum. Did I mention we have rum? And cherry coke (well, cherry coke zero)! It’s going to be a good couple weeks! Florida Trip – Day 2: The Ocean! Had a great night’s sleep last night and woke up refreshed. Got on the road about 8:30. The boys were excited about finally making it to Florida. Ryan was only asking about every 30 minutes how much longer until we got to Florida. Although sometimes, just to mix things up, he would ask how much longer until we left Georgia. Smart kid. We made it to the Florida Welcome Center about 11:30 and enjoyed our free glass of fresh Florida orange juice. A few rest stops later we arrived in Melbourne about 4:30. We got in touch with a friend of ours and made arrangements to meet him, his wife, and their dog. After visiting we went out for dinner at a little place called Long Doggers which had a total beach bum vibe going on. Food was pretty good and the atmosphere was busy. After dinner we headed down to the beach so the kids could experience their first trip to the ocean. Also, it was actually my first trip to the ocean while on the mainland. Only other time was back in ’97 when I was down in the Dominican. The kids had an amazing time! And Ryan only almost got swept out to sea twice! It didn’t deter him though. He was all about that ocean. Got some great pics while on the beach including an amazing one of Nikki. Back at the hotel now and calling it for the night. Tomorrow we make our way to Kissimmee to check into the villa for the remainder of our vacation. That isn’t until 4pm though so have to figure out what we’re going to do before that. Oh, and if there’s ANY possible way for me to move to a beach and live there I am totally doing it. So, I’m going to try to chronicle our vacation to Florida on a daily basis. But, to avoid publicly announcing online that our house is empty and available for robbing I’m not actually going to post these until we get home. The alarm went off this morning at 4:00am as planned and we were out of bed shortly after that. We got the kids up at 4:30 with almost no complaining and they were quickly ready to roll out. With the car packed we hit McDonald’s before getting on the highway. 5:22 saw us pull out of McDonald’s onto the highway and moving towards our destination. We made it to the border almost exactly two hours later and crossed with no issues. There was a stop at a rest area in Ohio somewhere and then we stopped for lunch at a Ponderosa Steakhouse in Florence, KY. There were also a couple other rest stop stops since one of us, who shall remain nameless (but rhymes with Icky), has a bladder the size of a pea. A baby pea. Supper saw us pull off the highway in Dalton, GA (every time I type, read, or say “Dalton” I think of Roadhouse) and the kids chose Pizza Hut. Our server, Mason, had the typical Georgian drawl. (Oh, I should mention – our server in Kentucky also had the cutest accent as well complete with the “y’all” – LOVED IT!!!) Got back on the road with the plan to drive just south of Atlanta and stop for the night. So here we are in McDonough, GA at a Howard Johnson just off the highway in an apparent bedbug-free room (I checked. Thouroughly.) We got here right at 9 o’clock. Traffic was smooth flowing the entire run. We had torrential rain pretty much the entire way through Tennessee and some of Georgia. There was the usual traffic through Atlanta but nothing that wasn’t manageable. There was one accident we saw in the northbound lanes of I-75 in Tennessee that appeared to be a single car. The back window was broken out so I figure it either rolled or was shot out. They had the highway closed and were routing people off which resulted in a rather lengthy (at least 2 or 3 miles I would guess) traffic jam in the NB lanes. We stopped at the welcome station just inside the TN border and thanks to the rain holding off at that point I was able to grab some great shots that show why they’re called The Smoky Mountains. I haven’t copied them off the camera yet and I’m writing this on the iPad so I’ll have to add the pictures at a later date. Okay, that’s it for the night. Morning will come early. Hoping to get to Melbourne, FL around 2 or so. Hey Everyone! I decided that I would do my best to take a photo every day for the year. We’ll see how it works out. To capture this attempt I’ve created a new blog to post the pics. It can be found at http://rob2013.surfergeeks.net/blog. Theoretically there will be a new post there every day. At the end of the year will there be 365 posts? Not likely, but I’m planning on doing my best. 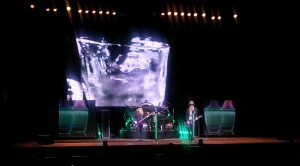 ZZ Top @ Budweiser Gardens. Nov 4, 2012. Sunday night I attended the ZZ Top concert at Budweiser Gardens as a guest of the #BGReviewer program they run via their twitter account @BudGardens. This is my review of the evening. I hope to bring something a little different to this installment of the #BGReviewer program over some of the previous reviews. I am writing this not as a sound guy (hats off to @LeGiff) or as a die-hard fan who relentlessly campaigned to earn their review (I’m looking at you @BHRaymond). I am writing this as someone who enjoys the band’s music but not someone who would call themselves a huge fan of the band. First and foremost I have to say a big thanks to the staff at Budweiser Gardens for providing the #BGReviewer program. Their generosity afforded me and my wife the opportunity to see a band that we may not have had the chance to see otherwise while enjoying some tasty refreshments. And the seats? I loved them! 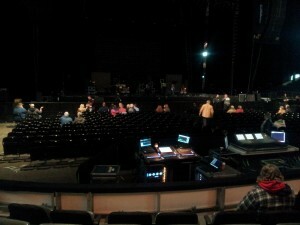 One hundred level, 5 rows off the floor, just left of center. It would have been hard for me to choose better seats myself. They are a seven-piece outfit that features a fiddle/violin player, lead guitar, rhythm guitar, bass guitar, drummer, keyboardist, and vocalist. Whew. That’s a whole lotta people. Some of the band would also change-up instruments and we saw the keyboardist play a mean harmonica as well as the accordion while the drummer broke out a washboard for one song. Sports fans, particularly NBA or NHL fans, may recognize the front man as James Dolan, the CEO of The Madison Square Gardens Company that own those franchises (among others). Their sound, appropriately, is a bluesy-rock that meshes well with ZZ Top’s sound. While one song was a little slow for my taste, I enjoyed the other seven or eight tracks and overall they had a great sound and found at least one new fan in the crowd. After a brief intermission while the stage crews switched setups the lights dimmed and the giant video wall behind the stage came to life. A pre-recorded video scene introduced the band and the members of ZZ Top, Frank Beard, Dusty Hill, and Billy Gibbons, took to the stage to a thundering applause. 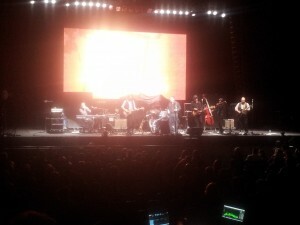 After a brief welcome the band launched right into I Thank You. They followed it right up with Waitin’ For The Bus and Jesus Just Left Chicago. I’ll mention the sound briefly here – the instruments were great. Each note resonated throughout the RBC Theatre. I did find the vocals to be a little soft at first and hard to distinguish although it did improve after the first couple tracks. After the three song introduction Billy chatted with the crowd and talked about walking along Richmond and also ending up at Novack’s for some hot fashion. The line of the night had to be Gibbons talking about the band saying “Four decades. Same three guys. Same three chords.” The next track was Pincushion followed by Heard It On The X before going into the first song off the new “La Futura” album called I Gotsta Get Paid. While I had a vague familiarity with some of the songs, others were completely new to me. The next group of songs delved into a more blues style with Vincent Price Blues kicking off the trio. “La Futura” was revisited again with Chartreuse before heading into the final three songs of the evening. We traveled back in time to “Afterburner” and “Eliminator” for Stages, Sharp Dressed Man, and Legs. The trio left the stage to mass applause and cheers. After a few moments they rejoined the stage having undergone their only costume change for the night, to close out the evening with an encore that gave us Tube Snake Boogie, a La Grange/Sloppy Drunk/Bar-B-Q medley, and, lastly, Tush. While there may have only been one costume change, there were no shortage of guitar changes. I counted at least 5 different guitar changes including an updated version of the furry guitars from the Legs music video. Speaking of the music video, the stage was dominated by a massive video wall behind Beard and two smaller panels on either side of him. 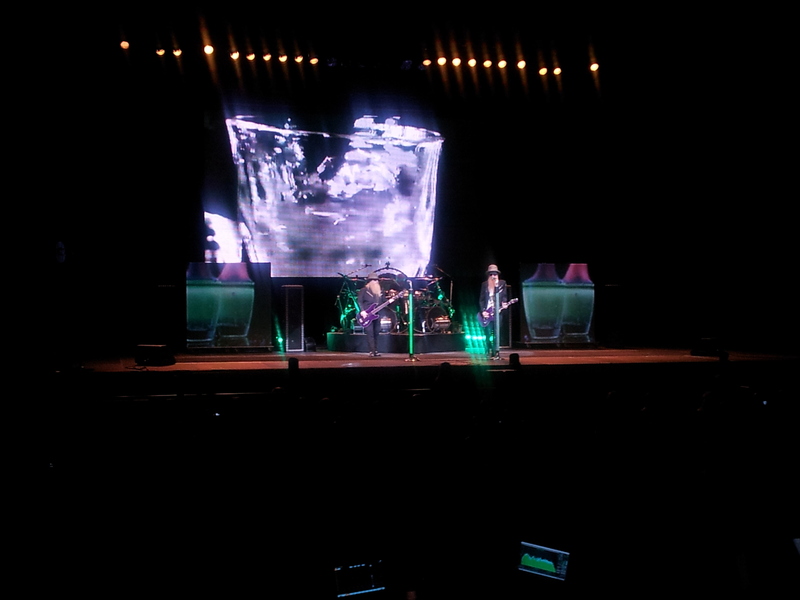 These played a mix of live video from the stage, old music videos, graphics and newly recorded footage for the tour. One of the frequent images on the two smaller were two simple words: “Basic Amplifiers” – presumably in reference to Gibbons’ preference of pure, simple sounds. These video montages were well coordinated although I did find them to be a little distracting. With a band like ZZ Top a lot of the stage presence is made up of sometimes small hand, feet, or arm gestures and I found that I would end up seeing the videos and missed these moments. While I’ve visited Budweiser Gardens for many other events, including the Prince show last year, this is only my second music performance and first for the RBC Theater arrangement. I enjoyed the coziness that the theater arrangement offers. 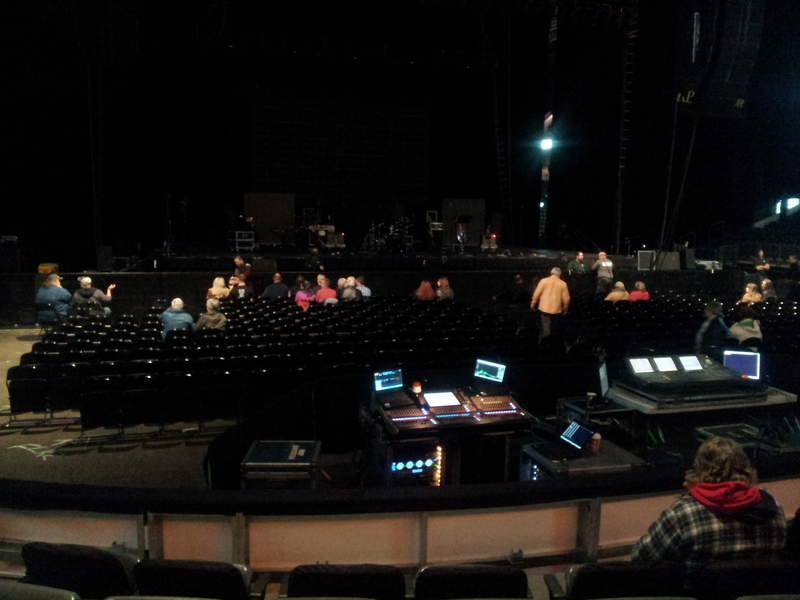 With a minimal floor section all the seats are nice and close to the stage and binoculars aren’t necessary. Budweiser Gardens even goes so far as to apply RBC Theater seat back covers on the seats as an added touch to draw you away from the fact you’re sitting in part of a 10,000 seat arena. That little ol’ band from Texas put on a big ol’ show that I happily count as one of the better concerts I’ve been fortunate enough to attend. To Billy, Dusty, and Frank: I tip my hat to you gentlemen. After four decades of playing, recording, and touring you still put on one hell of a show! Oh, the pictures are still available – they’re at the top instead of the bottom now. Just hover over the page and a drop down will magically appear. It’s kinda hard to read though. I’ll have to look at that. ps. It’s now been a month and half since I sent my letter to Mayor Fontana. I have received no acknowledgement of my email, not even a crummy form letter. [UPDATE] I think I like the theme you’re looking at right now. I’m gonna tweak it a bit and run with it for a while.